Had two big Elms 80 footers hanging over house and garage, to protect my roofing investment, called Out Greg at the Tree Profesionals, he gave me a quote, not only did he take care of the project I wanted, he informed me of city ordinance and sidewalk clearences and probably saved me money on fines. thanks Tree professionals, definately Professional. I received several estimates to have 3 trees in my yard trimmed. Tree Professional's estimate was the lowest bid. I couldn't be happier with the work they did. Not only did they do a great job, they cleaned everything up and carried off all the clippings. They did a great job and I would highly recommend them to everyone. My trees were in terrible shape after our very windy and snowy winter. I hired the Tree Professional on a recommendation from a friend and I as so glad I did. I received great service, a great attitude and a great value. I had very high expectations and they were exceeded by the Tree Professional. They treated my trees as if they were their own! Greg and the crew removed a huge old sycamore tree that was dangerously overhanging our home in Reno It had already lost a huge 1,500 lb branch in a recent windstorm(narrowly missing our house!) and was threatening to to either come down outright or at the least loose more huge heavy branches poised directly over the house and patio cover. In came Greg and his crew and removed the tree without dropping one single branch or piece of wood on the house or the patio cover! Greg is a real pro & a wonder to watch remove safely a huge old tree! A great job at a reasonable price. These are super nice people too! 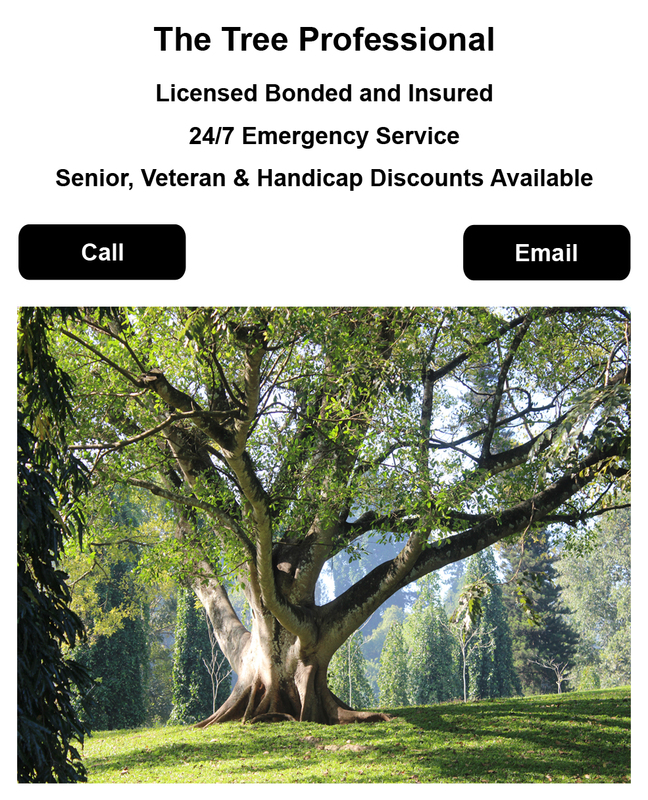 Highly recommend if you need tree service. We will def. use The Tree Pro in future for trimming of our other big old trees. The Tree Professional is exactly what their name professes; professional in every aspect. They completed and excellent job for my company and I would definitely use them again. Did good work in a reasonable amount of time considering the weather on the day the work was done. We had "The Tree Professional" do some tree removal & trimming in our rental. Their price was very reasonable. When the weather changed, Greg stayed in touch with me constantly to keep us posted and when the job could be completed. They were very prompt and courteous and cleaned up the jobsite. I would recommend "The Tree Professional" and will plan on using them in the future. After a heavy but brief snow storm a large branch from my tree fell into my neighbors yard and Greg came by and removed it and trimmed my tree to look gorgeous. I'll be calling him in the future for any tree jobs I may be needing. I highly recommend them! Great job, cleaned up good,price was right. Nice person to do business with. Will use them again! My trees look great. Greg did a fabulous job. I used his service at two of my rentals. Will use him again, and recommend him to anyone I know who need great tree work at a fair price. The trees in my yard are all 60 years old...so they are BIG...Greg got up there and trimmed them so I no longer have to worry about branches falling on my power lines or destroying other things in my yard! Great job!!! Greg came by and cut down a 60ft tree in a very tight space in my back yard. Scheduling was fast and easy. The job was done surprisingly quick and in a very professional manner. He left the yard clean and free of any debris. We will be calling back soon for another tree job in the front yard. Thanks again Greg! We had three trees that needed to be cut down and a least 10 trees that needed extensive trimming. He gave us a fair bid and did the work on schedule. He and his team went far beyond expectations. They picked up every twig and leaf. I would hire Greg again and have, to extract a tree on my commercial property. Greg has several times provided care for my big silver maple trees and a big oak tree. He unfailingly shows up on time, with the right skills, the right tools, and the knowledge of what trees need. The price is appropriate, and his helpers leave the work site clean and neat.